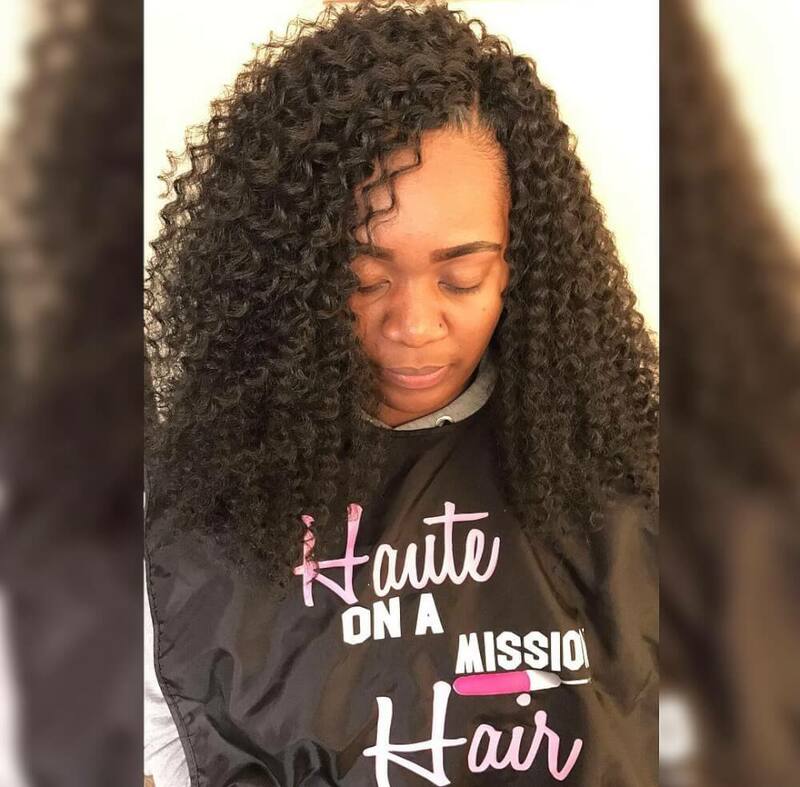 Crochet hairstyles were always around, but thanks to some creative stylists, they have been re-invented in a whole new way! 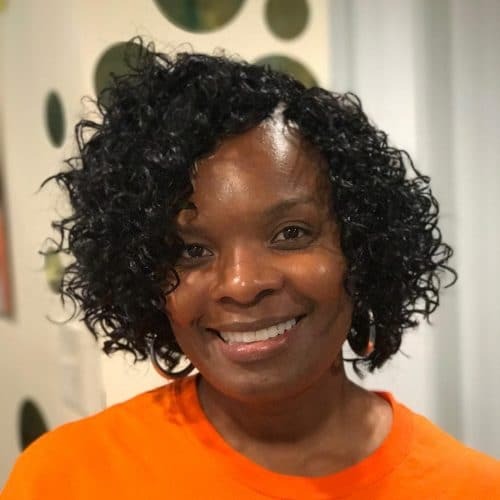 If you’re a black woman on your natural hair journey, then you’re in the right place to find your next protective style. 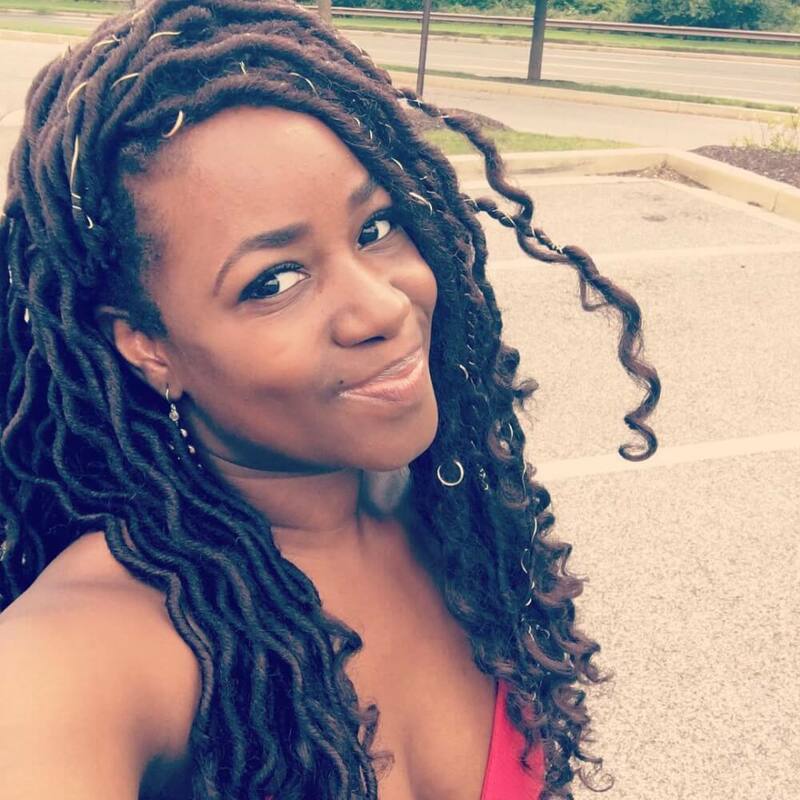 Check out these amazing and protective crochet braids, twists, locks, dreads and more below! I love this braids because it’s a lot different from all box braids we’ve been doing for a long time. It looks unique and different, and you can as well style it as you like. Maintain the curls with mousse and use a good product. Also, it lasts longer. 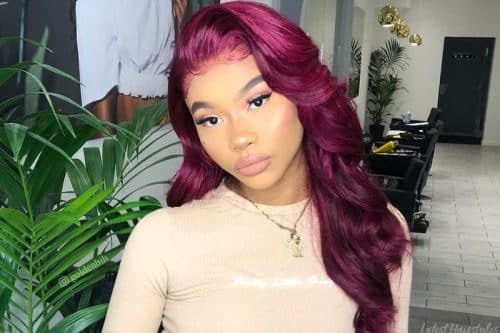 This look is definitely your go to if you want to try color but afraid to go all out. My favorite thing about this style is that it says “I’m conservative but I like to party”, with the pop of pink saying it all! Go for it. Be sure to have a professional like me to install. Be sure to get treatment before and after and use Influance hair care products like rosemary stimulating spray, organic complex and coconut milk leave-in conditioner to maintain the scalp. In addition, to keep it up and out of the way during resting hours simply use a large rubber band to put in a ponytail and tie a scarf and voila! This look is authentic, stylish, and diverse. My favorite thing about this look is how it can be authentic and diverse for some many ladies young and old. This braid look has the ability to complete and complement a style for my client in so many ways. This look will give my client so many diverse styling options and help protect her hair. Find yourself a stylist that understands your hair type. Have a consultation. Just like you would for a color, hair extensions, or hair cut. Do have a consultation prior to your braiding. Normal braids, crochet, twists, and wigs or braided piece options are endless. Also, length and sizes are endless too. Make sure you do a treatment before your braiding and during I highly recommend Olaplex. This range works for all hair types. Now with Olaplex 4 shampoo and 5 conditioner available, this is yours to go for when wearing braids. Your hair still needs moisturizing and conditioning while in braids! So find a brand that will do this for your hair. 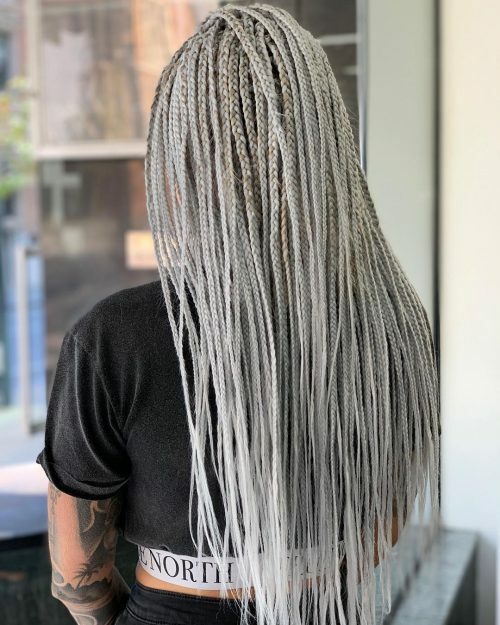 Braids are diverse, fun, protect your hair and suits so many lifestyles, so go for a style and colors that suit your personality, work environment, and lifestyle. Most of all, have fun wearing them. After all, braids have a way of bringing beautiful compliments from so many people your way. I would describe this look as an everyday hairstyle for the get up and go and type of female. I used six packs of Freetress Synthetic Braid-2x Soft Curly Faux Loc 18, as well as one pack of braiding hair (any brand will do). 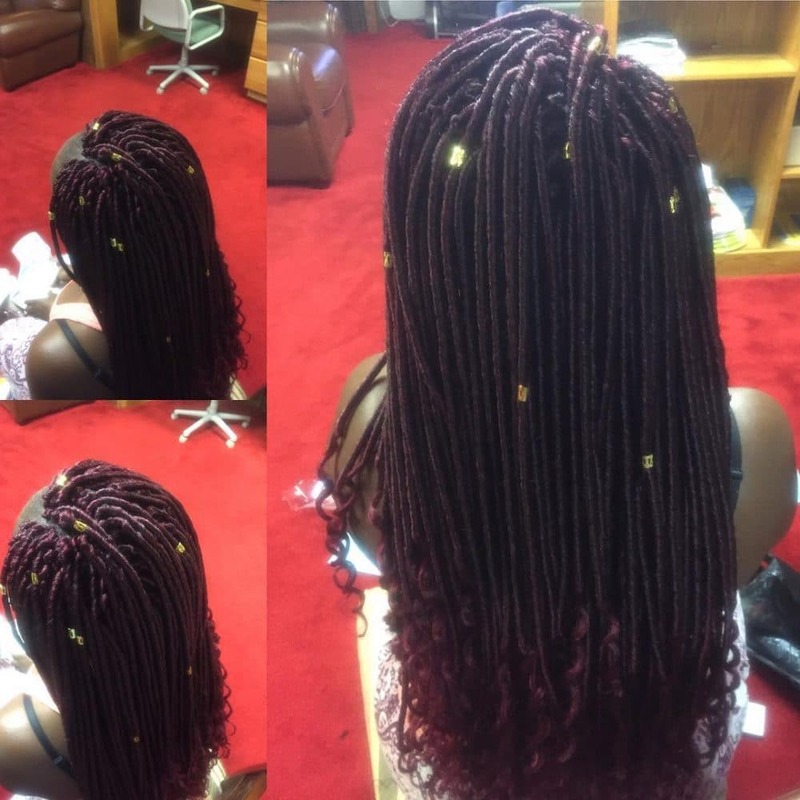 The type of client I would recommend for these crochet hairstyles is a woman who doesn’t like heavy hair or sitting for numerous hours. This style is also a great alternative for someone who wants to dread their hair. Hairstylist @ Hair by OJ in London, U.K. This look is a curly crochet braids style which is very popular. The crochet hairstyles done in a bob are very trendy and works great in the summer. It is also a great protective style! The curls are definitely the key to this super cute hairstyle. If you want to recreate this look with your natural hair for instance, you could use a curling creme or you could do a ‘twist out’. If you don’t mind using heat, you can use a curling wand or even rollers. The options are endless! I recommend these crochet braids for those with natural hair that they want to put away and protect. The bob shape will suit a small face or heart shaped face, but I’m sure anyone can pull it off with the right cut! We used the crochet braid method the create this look. I love that it has a youthful, carefree look about it. Natural curls work great here. 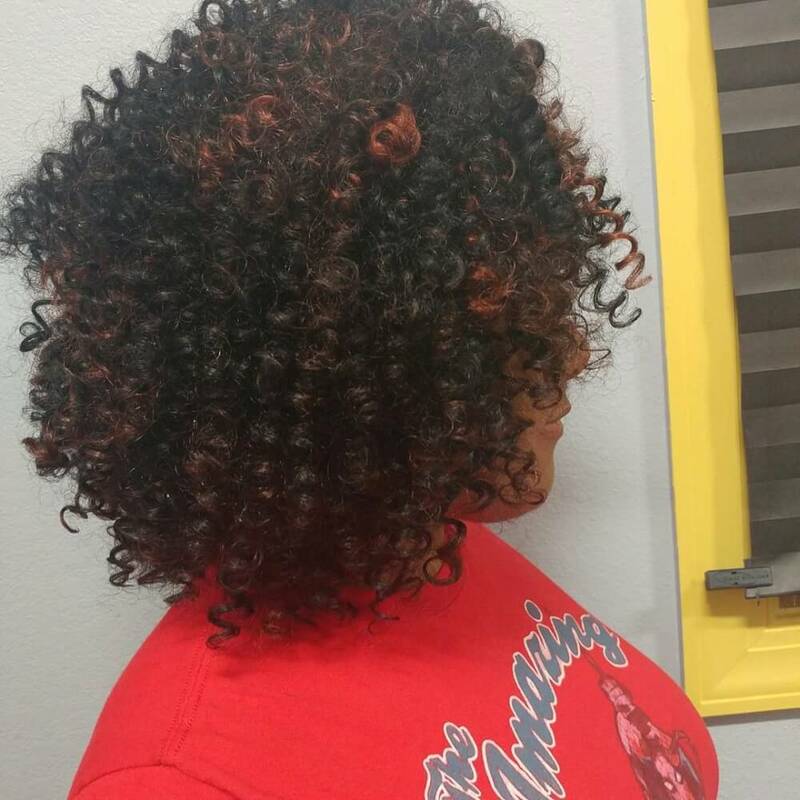 We used the Water Wave hair by the brand Freetress. 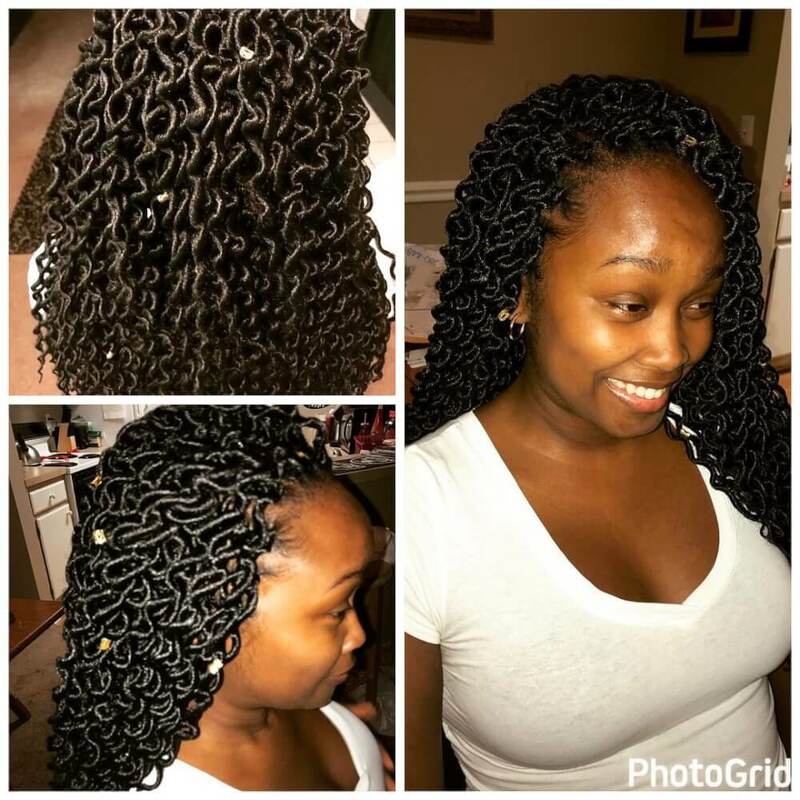 Water Wave is a great product for creating these crochet braids. To make this look easier to manage, I suggest the “bulk” version of that hair. 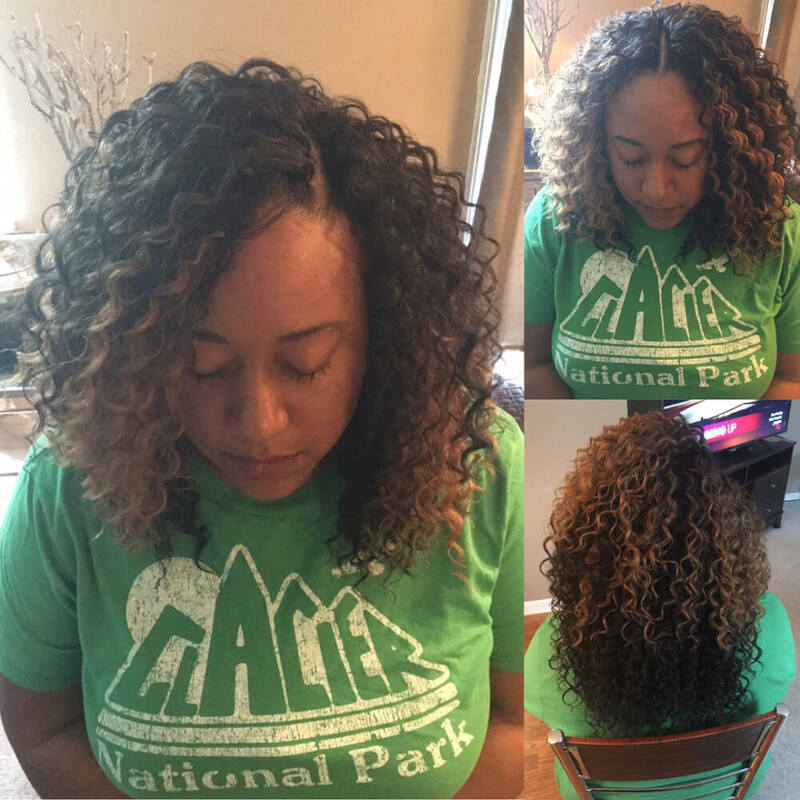 Most clients get crochet braids in order to give themselves a break from styling the hair on the daily basis. That being said, this crochet braid style does take a little maintenance. If you have ten minutes a day to maintain this hair, then it’s definitely for you! It can be styled for any occasion because the versatility makes pinups possible. This is the go-to crochet hairstyle that gives a client 101 ways to style an install. It’s the most effective when it comes to style retention. The long strands last longest and require absolutely no maintenance whatsoever unless the client prefers. This hair is perfect for clients with active lifestyles. My favorite things about this look are that it is quick to install, it protects the hair without breakage, it is easy to achieve the single plait look, and it is flattering, stylish and can be worn in a number of different styles. To recreate the crochet braiding, you will need a crochet latch hook, crochet twist (hair piece), comb and oils to apply on the scalp. One important tip when braiding the hair is not to braid the edges too tight to avoid breakage or receding frontline. To help maintain the twist extension, you can run hair mousse (extra hold) through when needed. This helps to hold the shape and refresh it, eliminating that dry and dull appearance. You also want to make sure to moisturize your scalp daily with natural oils. TIP: To lay down edges and help ensure the hair looks neat and clean, I recommend the client use Edge Control. This hair is recommended for all clients looking to protect their hair, especially clients who have a busy lifestyle. Clients with a thinner hairline might not get the best result as their hair might have a receding look when styled in a bun. All face shapes can enjoy this install because of the option to style in so many different ways. This is a natural and playful look with a little sass to it. It is fast and convenient to do. My favorite things about this crochet braids style is that it looks natural and gives an appearance that it’s individual box braids when it’s actually not. YouTube has good tutorials for individual crochet and box braids. Know your braiding products and what works for your hair or clients. On this particular client, no braiding products were used, only oil sheen at the ends. 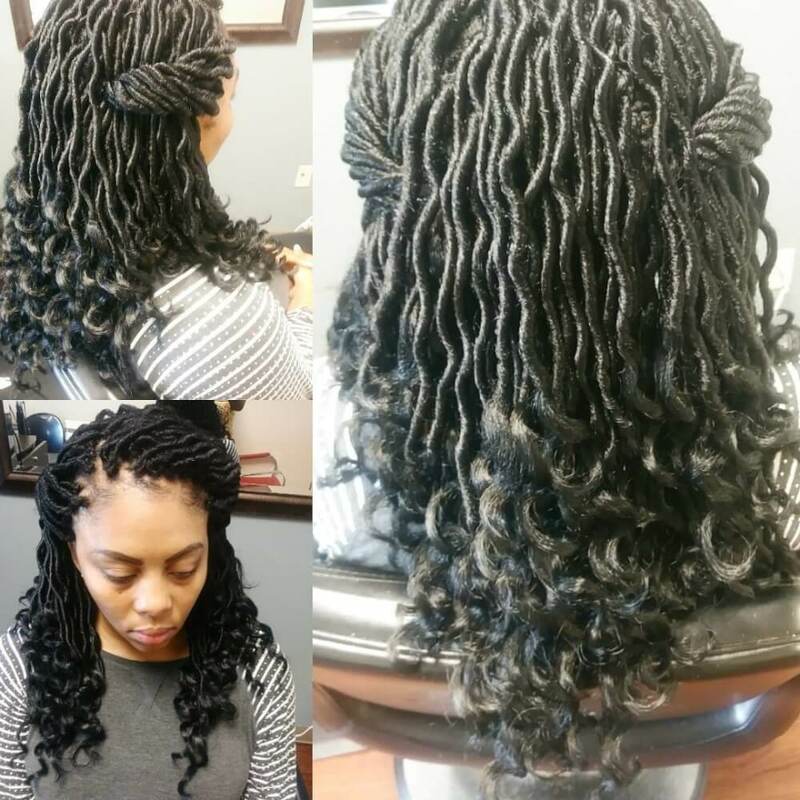 Some clients, depending on hair texture, will need products for braiding. Any client that desires this look can achieve it. I think it looks best on oval or round faces clients. All hair types and lifestyles can wear it too! I would describe this look as a simple but edgy crochet braided loc style. The favorite things about this style are the versatility and also the simplicity to it. This style can be structured in three different ways with two invisible parts and one middle part. Since the client’s hair is braided under the style, I suggest oiling the scalp at least every three days. This will help to avoid build up and dry scalp. Some of the products my clients use consist of mainly organic oils, such as coconut oil and olive oil. Any oil can be used to help keep the scalp moisturized. This will help to keep the style lasting longer. 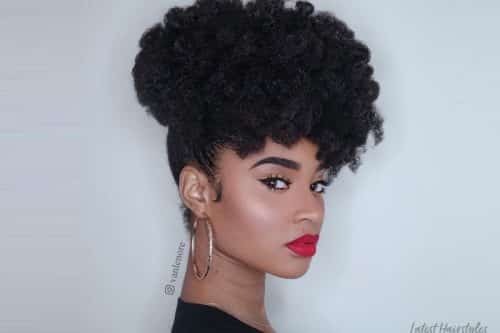 The type of hair that I recommend would be someone with course afro texture. This will help to keep the braids secure and tight underneath. This can be worn with any face shape and lifestyle. This look is the crochet faux locs style. What I love about this style is that it lasts a month or longer depending on the person. I also love the fact that it only takes two hours to install this look. 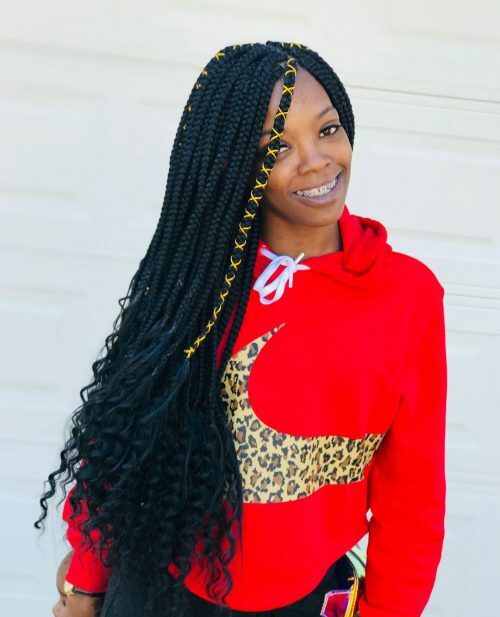 One tip is that you should always use synthetic braiding hair when braiding your natural hair into a pattern so that the style stays nice and tight. I also purchased hair accessories that I found at Michael’s craft store to create a more dramatic and unique style. No products was used for this style, but if your hair tends to be dry, you may want to apply a light oil such as coconut oil to the crochet braids. 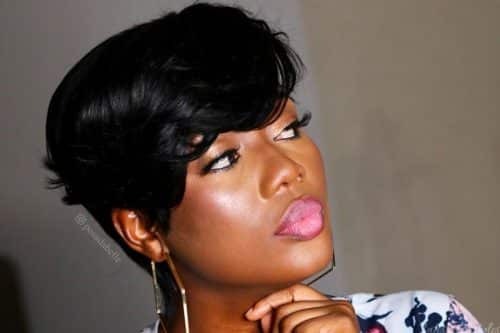 I believe any client can wear this style, but it is usually seen on Naturalistas! This is a trendy, medium length crochet weave with some brown color that is bound to make a statement in any environment. These curls are absolutely perfect for the spring and summer months. It’s classy, it’s chic, it’s convenient, and it’s versatile. My favorite thing about this style is how affordable it is. This install gives you the look of a full sew-in with a closure, but for a fraction of the cost! What is there not to like about this style? Because this is a protective style, you’ll want to start off with freshly washed, conditioned and moisturized hair. The foundation is the most important aspect of the style. There are a number of braid patterns that can be used depending on how my clients want to style their hair, but regardless of whatever pattern is chosen, the braids should be installed in a way that provides a smooth foundation. 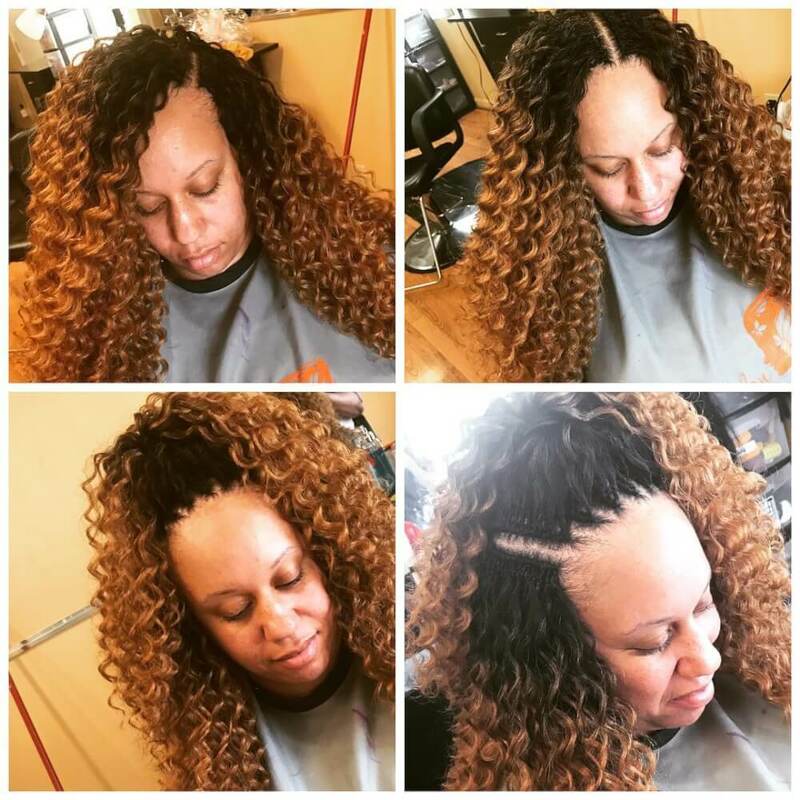 In order to achieve the most natural look in the parting area, I use smaller braids and a modified knotless method when installing the hair onto the braids. In regard to maintenance, I always recommend that clients get a satin hair bonnet to sleep in. This prevents the hair from rubbing against itself and causing frizz. I also advise clients to cut the frizz away. Frizz leads to tangling which leads to matting. Lastly, because this is synthetic hair, I do not advise using anything on the hair besides water and alcohol-free mousse. Avoid using a mousse that contains alcohol due to the drying effect it has on the hair. One of the many things I love about this style is that it does not discriminate. All clients of varying face shapes and hair types are able to rock this style and look fabulous while doing so. It is important to find a stylist that knows how to cut and shape the hair so as to make the style their clients’ very own. Kinkier textured hair typically gets longer wear out of this style. 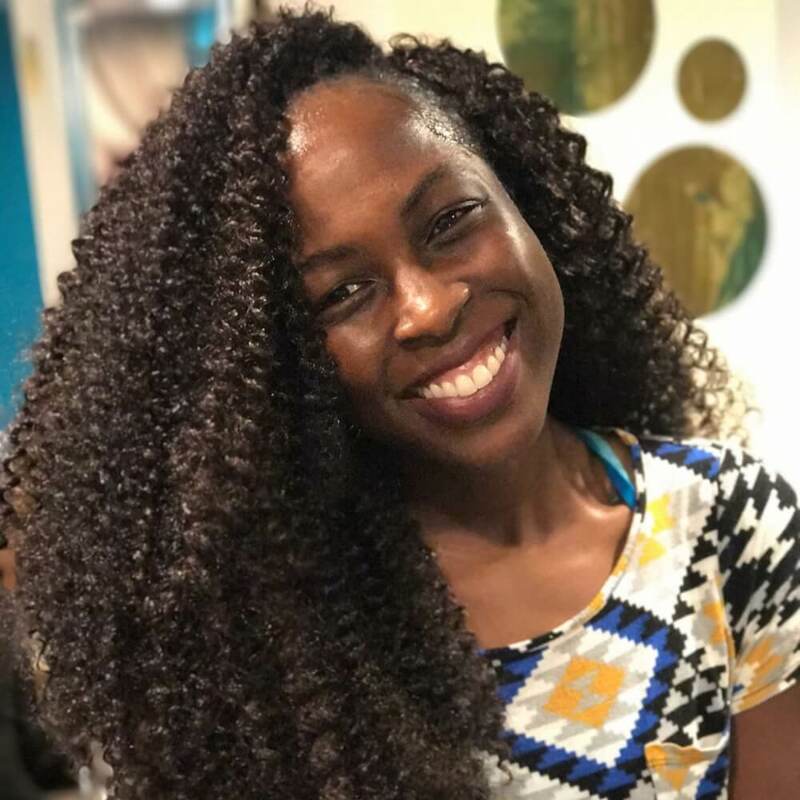 Crochet weaving is perfect for someone looking for an inexpensive protective style, and/or someone on-the-go and looking for a convenient style that requires minimum maintenance. 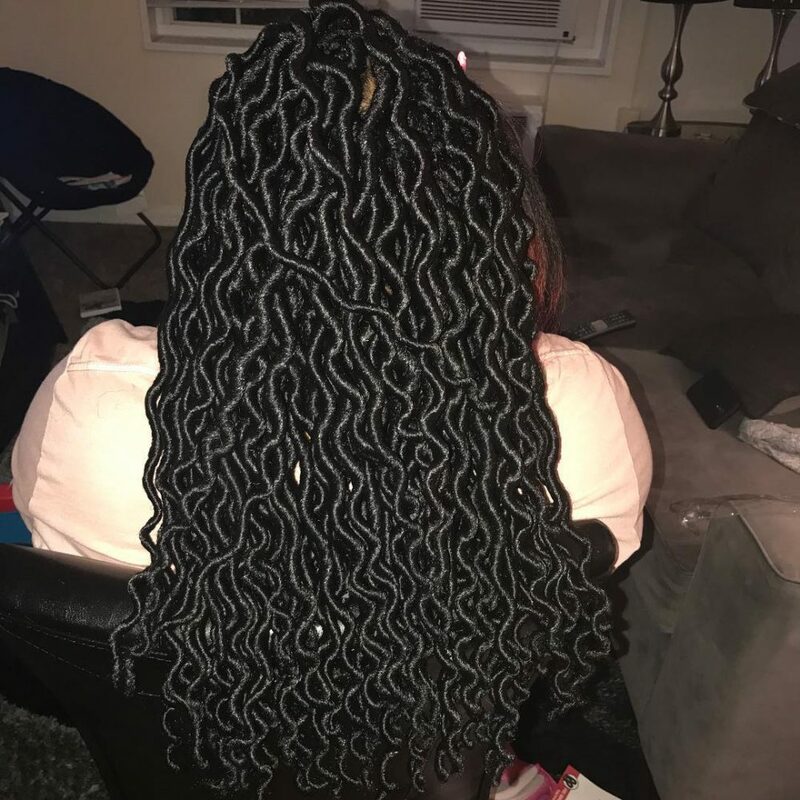 These are crochet goddess locs and they are very similar to natural dread locs. My favorite thing about this particular hairstyle is that it’s very versatile you can style it just as you would style natural locs. 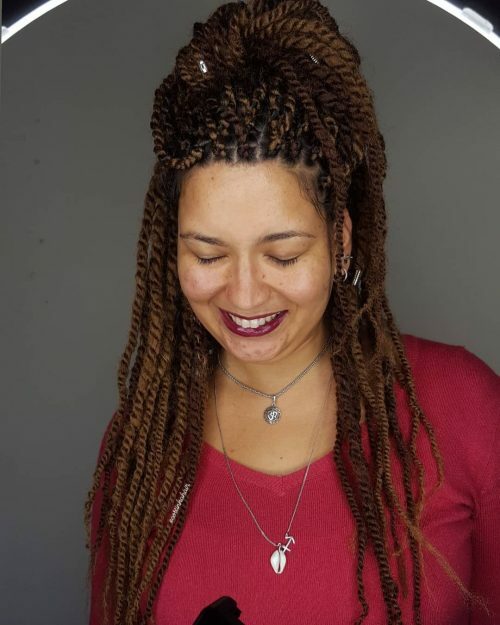 To achieve this look, all you need are seven packs of the Freetress goddess locs crochet hair, a crochet needle, a comb, and clips to hold your hair on place. No products are needed for this particular style. The great thing about this style is that anyone can wear it. No matter the age, shape or lifestyle, this hairstyle can fit anyone. This look is fun and funky! My favorite thing about it is that it is so low maintenance that anyone can maintain it. You can also make this style as big as you like. To recreate this look you can use X-Pression Whirly Loop crochet hair. Use a light oil to give it some sheen and you are all set. Make sure to pull each curl bundle apart for best results. I recommend this style for anyone looking to give their hair a rest. It is also perfect for a client that is on-the-go and likes versatile styles. Stylist Eva kept it real with a wonderful handiwork of thick braids. Not only does it protect the hair, it also is a statement in itself! I would this describe this look as a versatile style. My favorite thing about it is that you can wear so many different ways. I would definitely recommend that you keep it detangled and use mousse and a little oil spray. This a great protective style for natural and relaxed hair. It will fit any face shape because you have so much versatility with this style. Freelance Hairstylist @ Lizz Davies Hair in Birmingham, U.K. This is a tightly curled look using extensions with an ombre effect. My favorite thing about this look is the versatility it brings. This look can be parted to the side, in middle, put up in a bun, and even more if you are creative! First, you need to purchase good crochet extensions, which you can usually find in a hair and beauty shop or beauty supply store in the US. You also need a good cornrowed base and a crochet needle. After the hair is installed, apply mousse and trim and shape to finish. I would recommend this look for people with afro textured hair in order to create a solid cornrowed base. This is also great for people with shorter hair who want a longer look. In accordance to lifestyle, this would suit those who like to wake up and go in the morning or those with busy schedules as it does not require much upkeep. 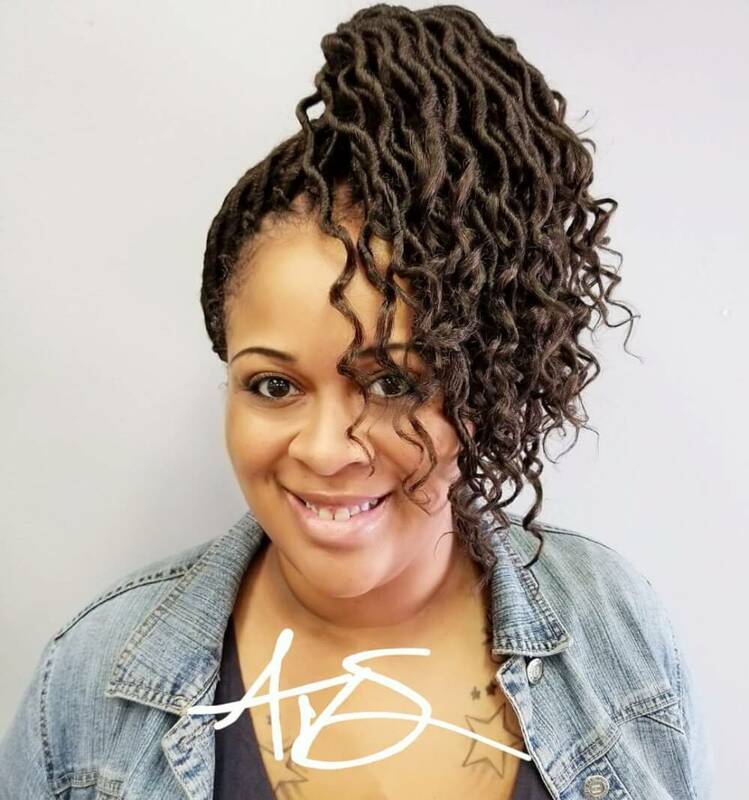 With this specific look, her natural hair is cornrowed to the back, and then the synthetic hair (Kima Brazillian Twist) was applied with a crochet hook to install. My favorite thing about this look is how natural it looks. 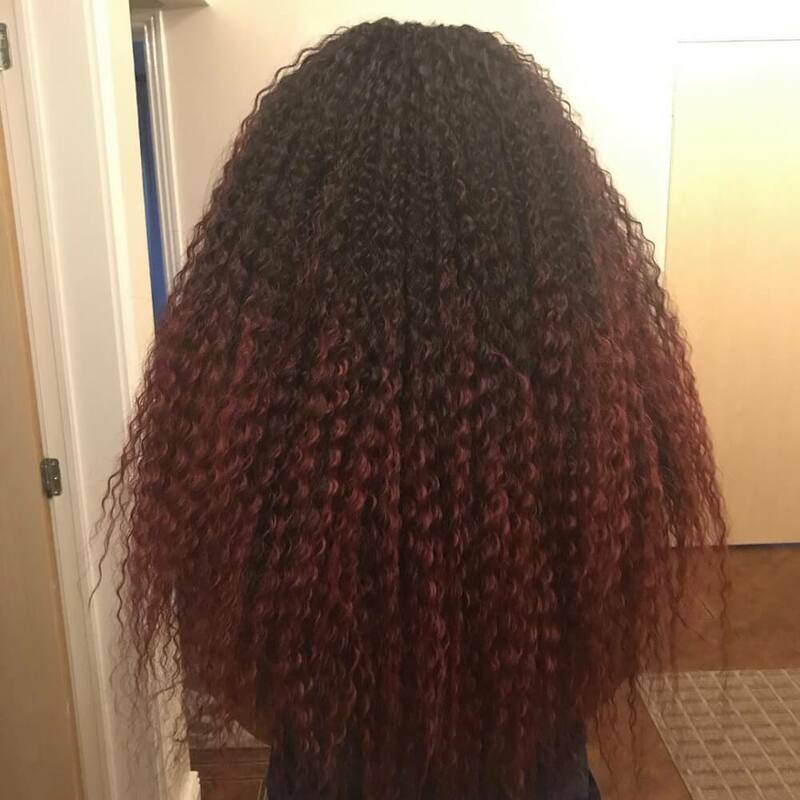 You can’t even tell these are crochet braids because I go above and beyond with all of my clients to ensure that this protective style is very natural looking. To recreate this look, you will need to buy four packs of Kima Brazillian Twist hair, a crochet hook, edge control, and a comb. 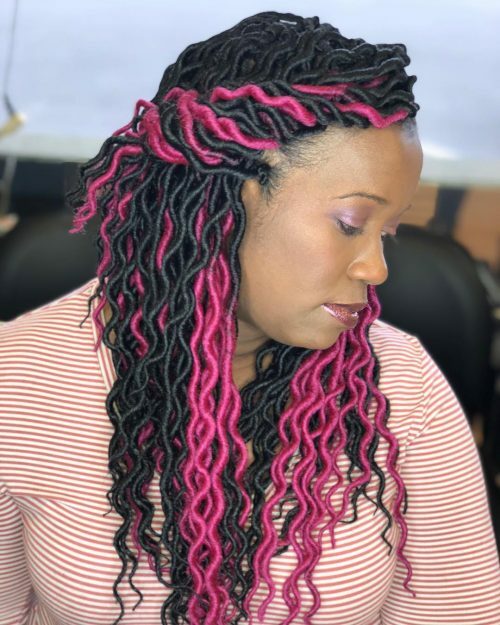 Depending on your client’s hair texture or if you are doing this style on yourself, you may want to apply braiding hair to your base when braiding to ensure that your braids are secured. 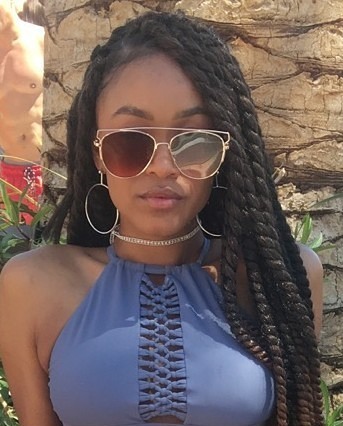 This is a protective style option is ideal for all hair textures and lengths and can create many unique hairstyles. This includes relaxed, natural, pressed and transitioning hair. I would describe this look as crochet goddess locs and if you are looking for hairstyles fit for goddesses, then here you go. It is perfect for summer! My favorite thing about this look is that all of your hair is braided and the “locs” are attached to the braids which offers protective styling. This hair is very low maintenance. 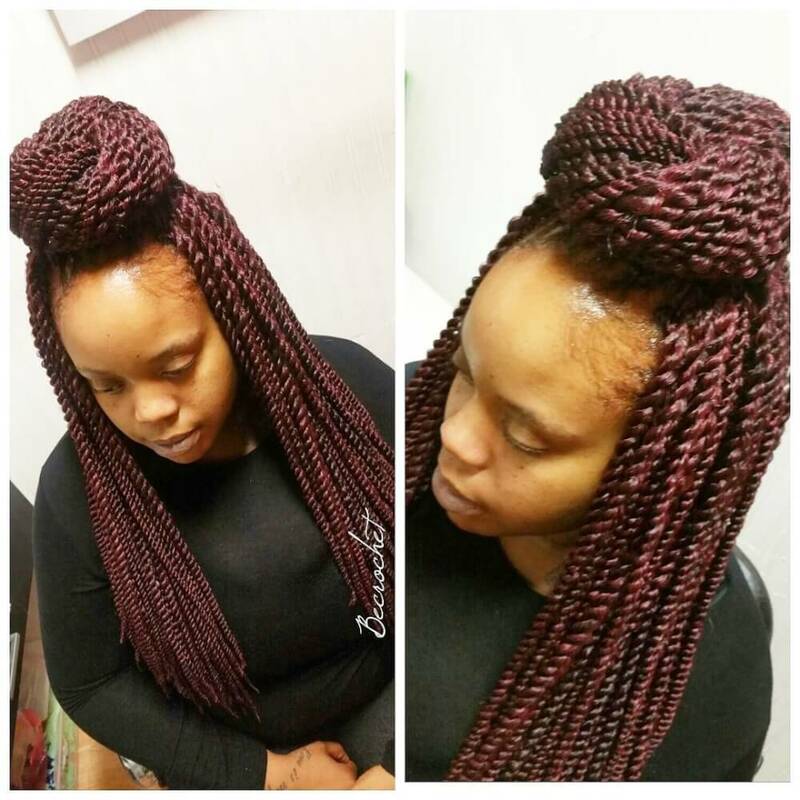 To achieve this look, you would just need to purchase the Freetress Goddess Loc crochet hair extensions. The perfect client for this look is one that wants a funky, fun look. Over the years, locs have a bad reputation for being unkempt and strictly for a rebellious individual. Today they are very beautiful and also provide a fun, edgy look. 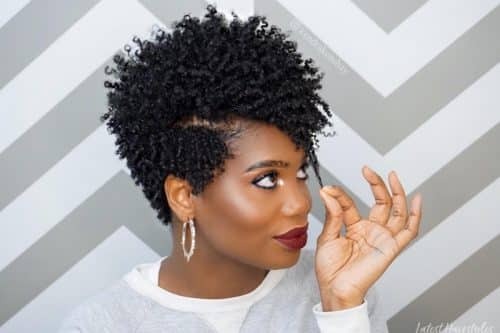 This is a fun, exceptionally versatile and protective natural hairstyle. My favorite thing about this look is that it takes less time to install as compared to sew-in braids. It also takes less time to remove and the scalp breathes easier. To create this look, you will need braiding extension hair to do the cornrows, a latch hook tool, Goddess Locs hair, and hair moisturizer. My best tip is to always moisturize your roots and keep the scalp oiled. 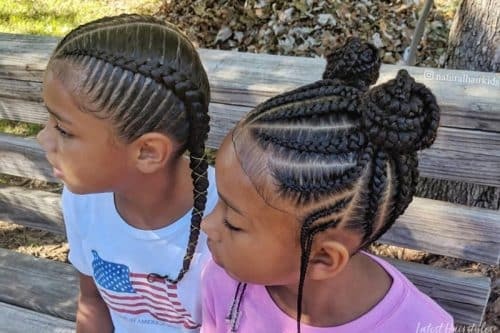 Do not braid the cornrows too tight because this is a protective hairstyle. In my opinion the crochet braids will look good on anyone and everyone. It’s versatile, fun to play around, and always easy to maintain. 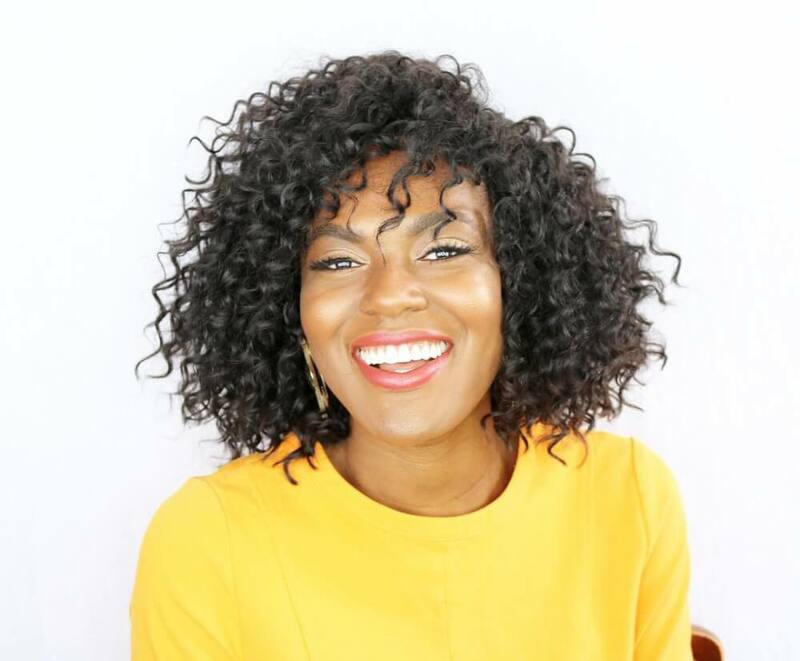 These are short crochet braids using Gogo Curl hair by the brand Freetress. I love how the hair is full but not frizzy. When this hair is installed, just be sure not to separate it too much. After install, use mousse to take the air out so it won’t be too full! This style works great for women who need to have their hair look a certain way for a professional environment. It’s a long-term protective style, so if you are busy and on the go, this style works great!